Observation - Knot flock at high tide roost - Kinneil Lagoons - UK and Ireland. 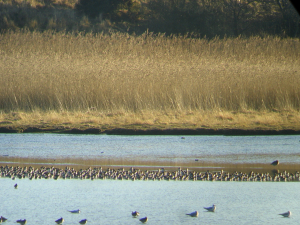 Description: Knot flock observed at Kinneil Lagoons, high tide in Firth of Forth. Knot flock observed at Kinneil Lagoons, high tide in Firth of Forth.